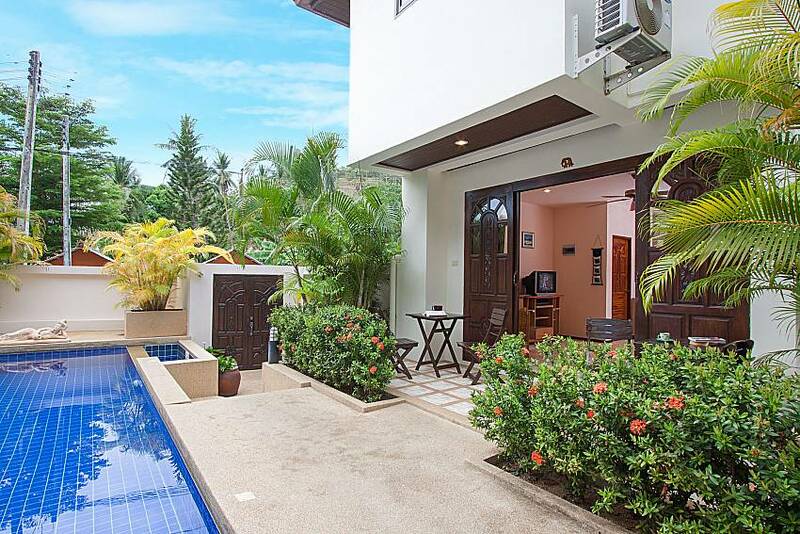 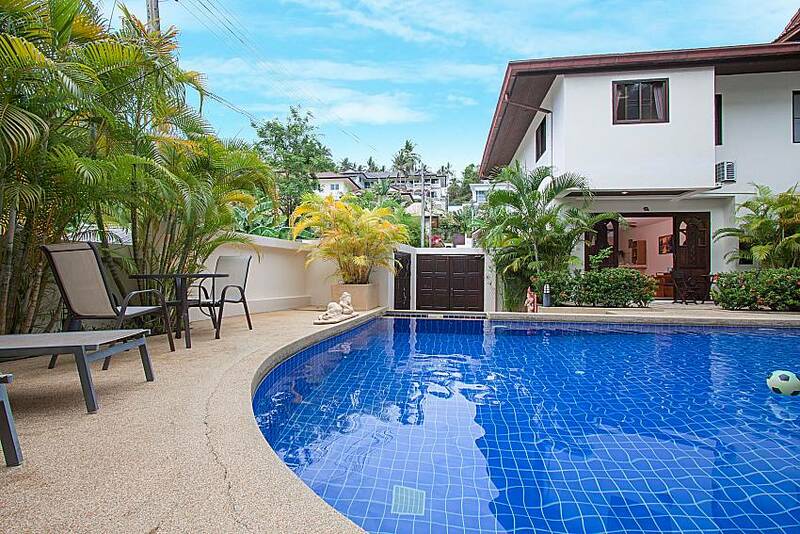 Minutes away from tourist hotspots Chaweng and Lamai, Wạn Hyud Villa is tucked away only 300 meters from Chaweng Noi beach. 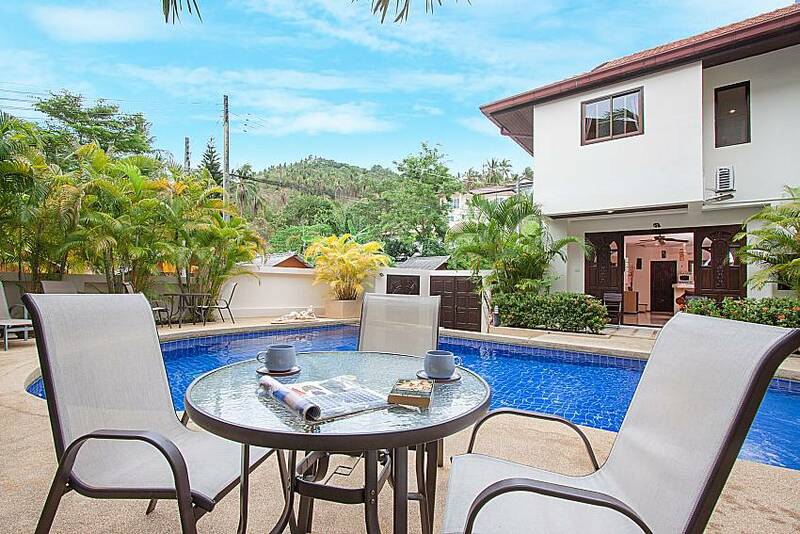 This 2 bed, 4 person villa is one of the 5 townhouse-style villas in this development, which makes it a fantastic choice for groups travelling together. 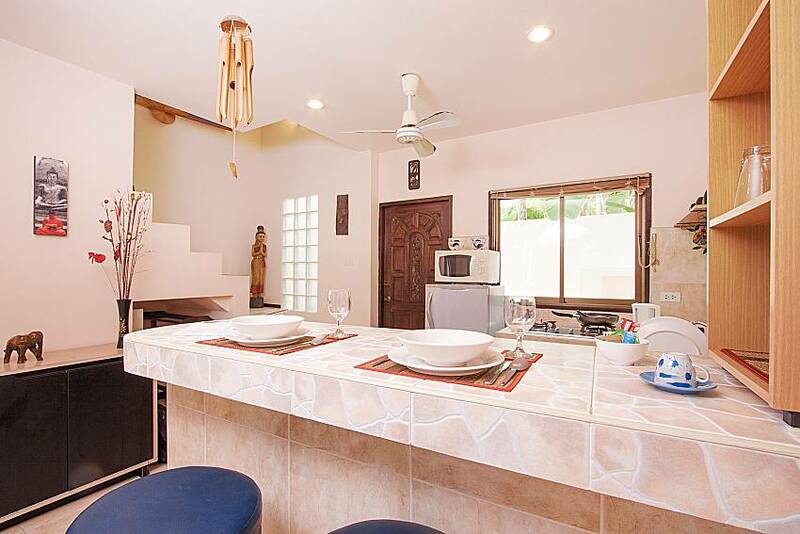 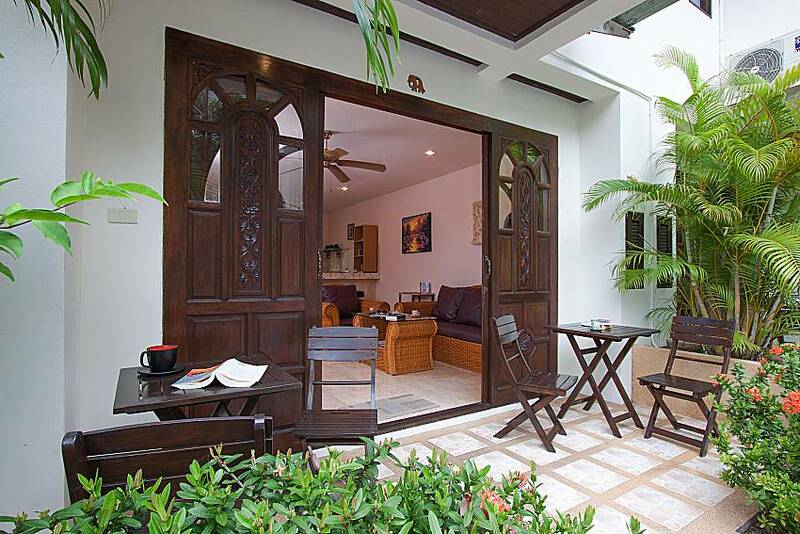 On a small private complex that features five townhouse-style 2-bedroom villas and four 1-bedroom condos, a stunning Thai style wooden door opens up towards a spacious open plan kitchen and living area. 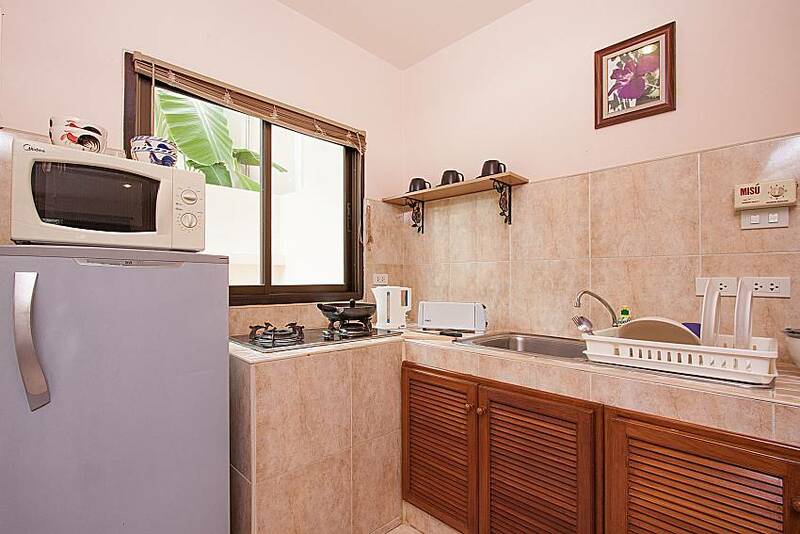 The cream tiled floor leads you firstly to the fully equipped kitchen, where you will find amenities such as a fridge, microwave, toaster, hob and kettle. 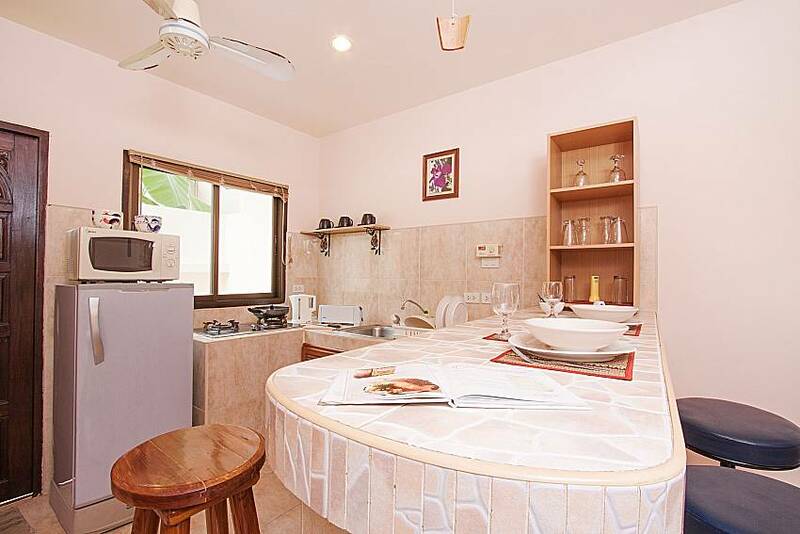 Additionally, the kitchen also has a casual dining area with a breakfast bar and 4 stools. 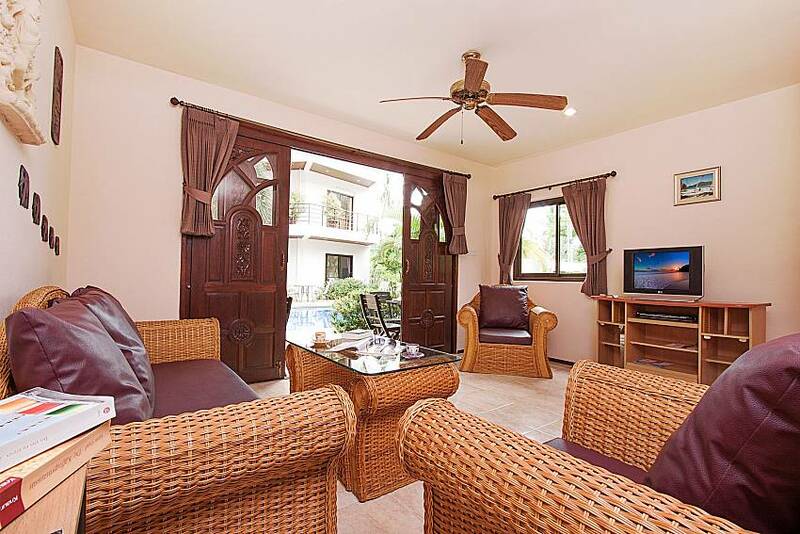 The living area boasts of a generously sized 3 piece wicker sofa where you can relax, put your feet up and watch the cable television. 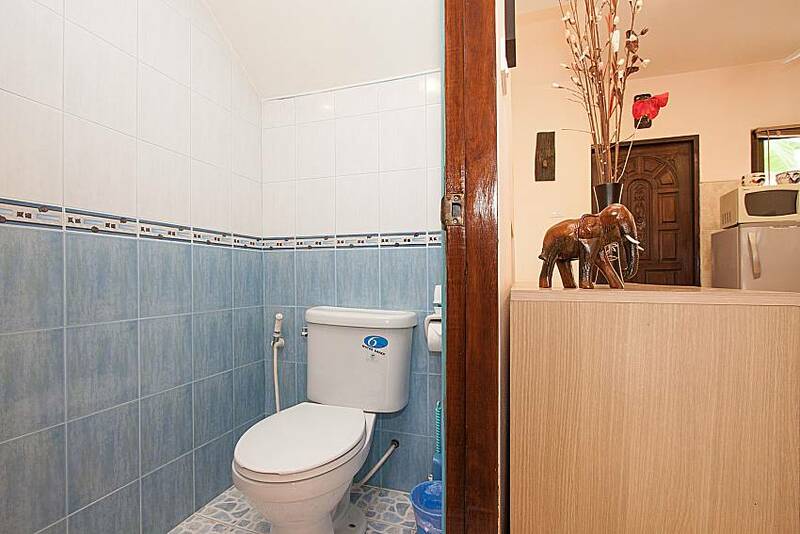 Here you will also find a downstairs toilet for added/extra convenience. 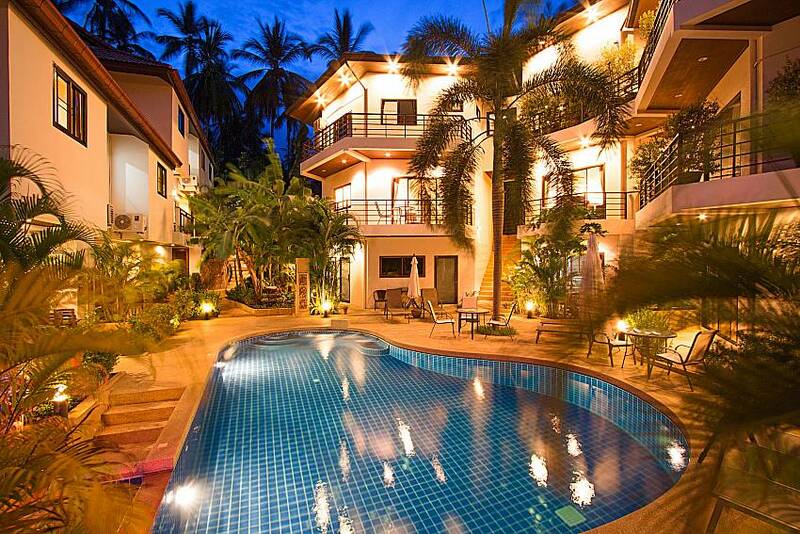 This property has excellent Wi-Fi throughout. 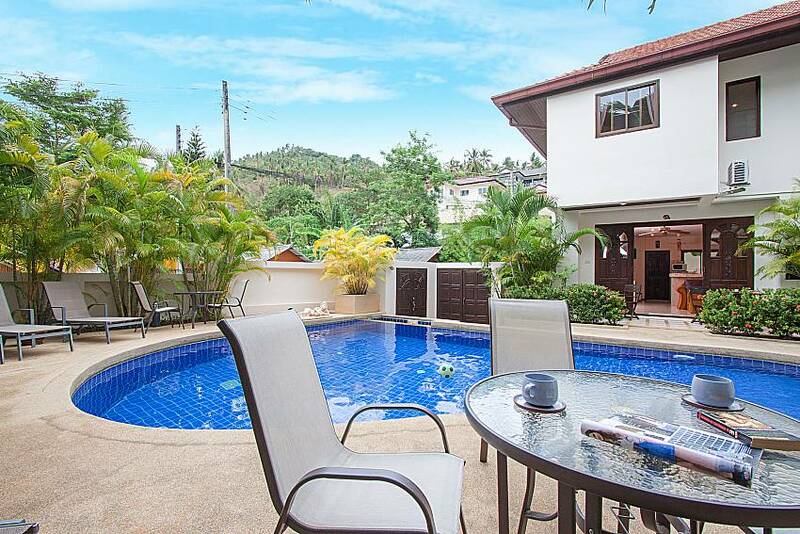 From the living space, two huge doors open up onto your own terrace with seating which overlooks the beautiful communal pool with Jacuzzi, equipped with sun loungers and dining area. 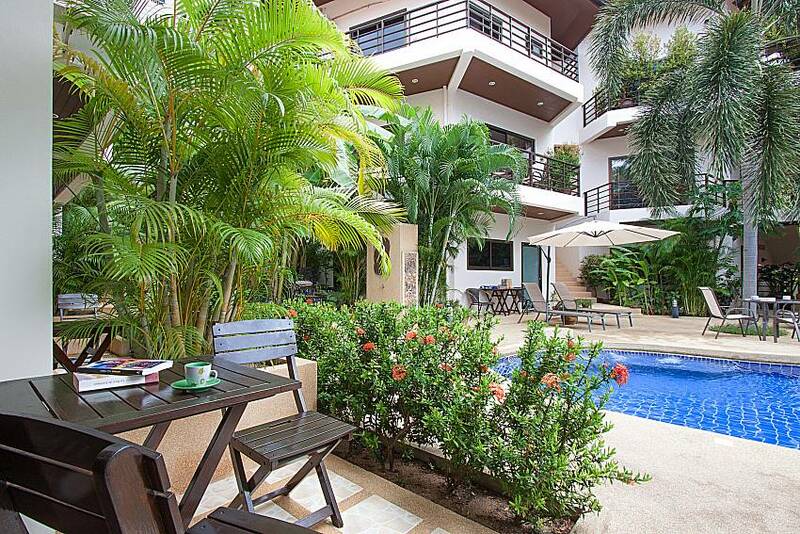 There is also an idyllic secluded garden where you can appreciate nature. 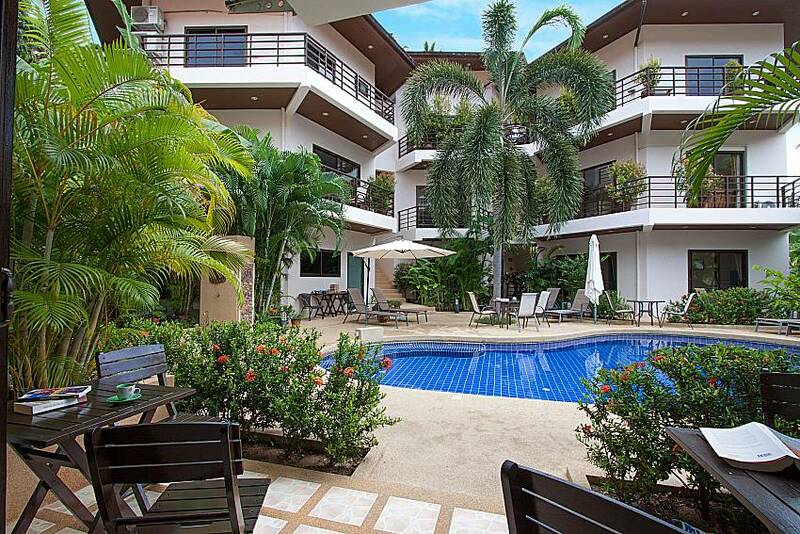 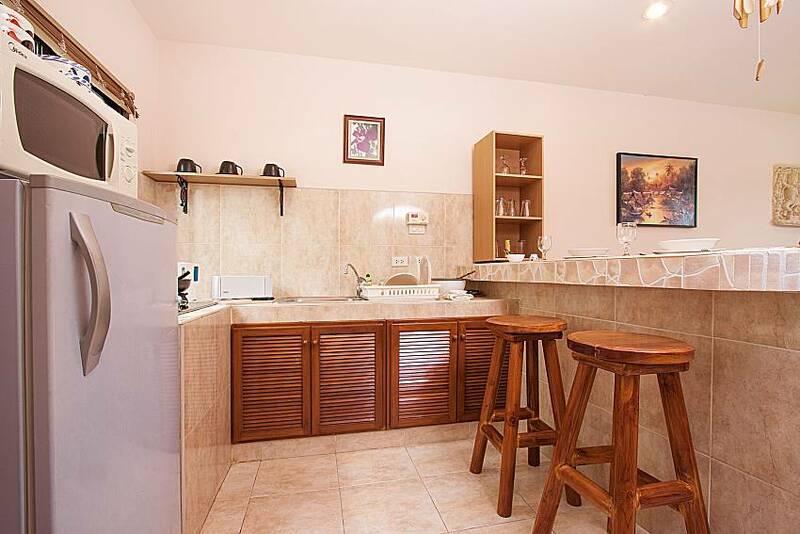 If you are an extended family or a group of friends travelling together, it is possible to rent several units in the complex and enjoy a shared holiday in this haven. 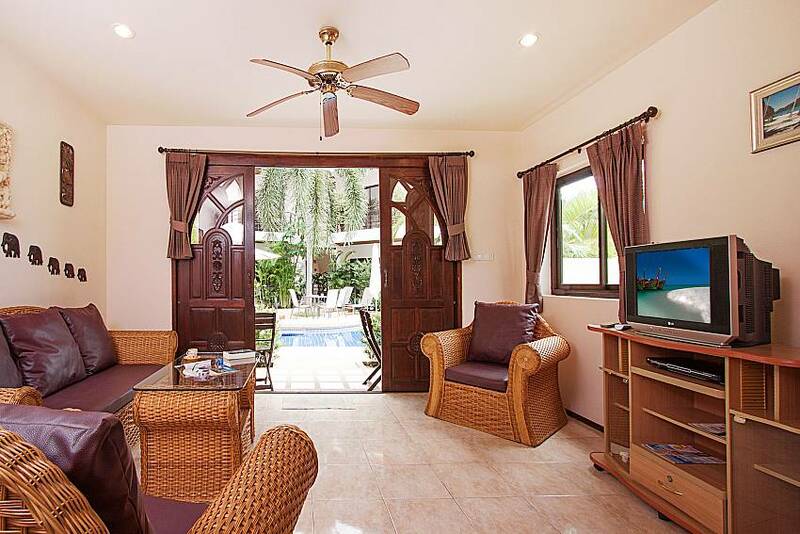 From the open plan living and dining area, heading up the stairs, you will find a large homely double bedroom with wardrobe. 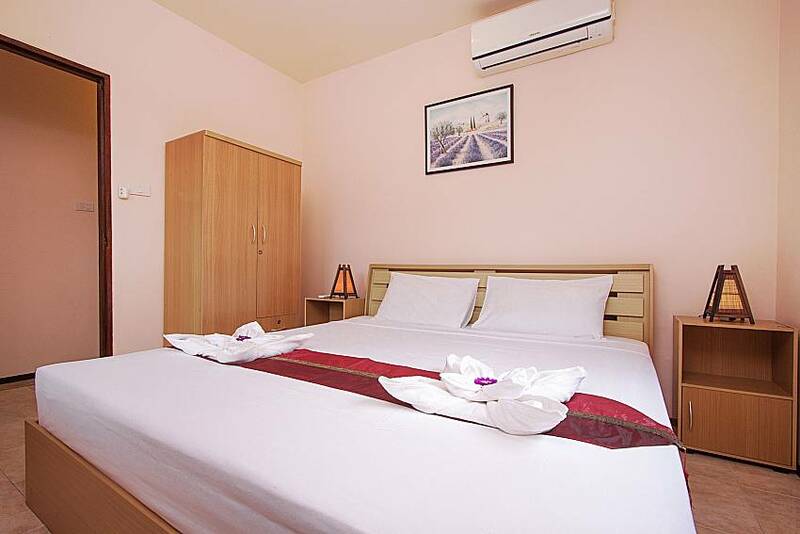 The second bedroom is again, a large room yet has two single beds and a wardrobe. 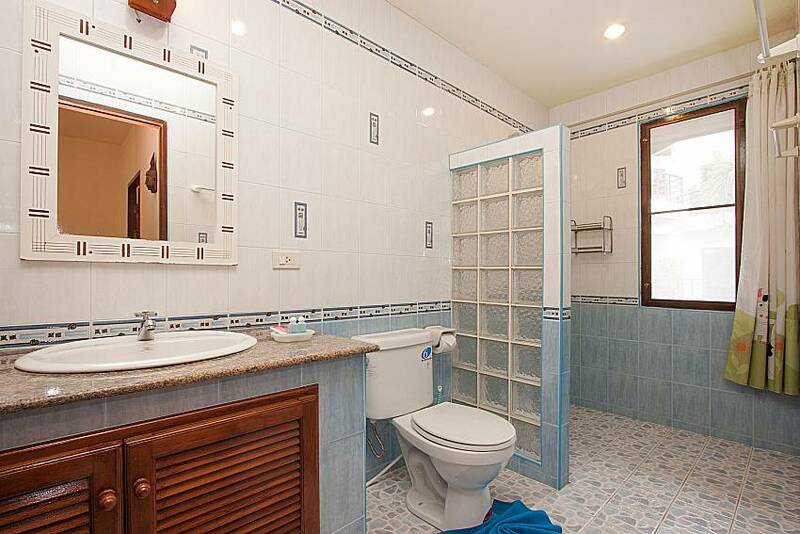 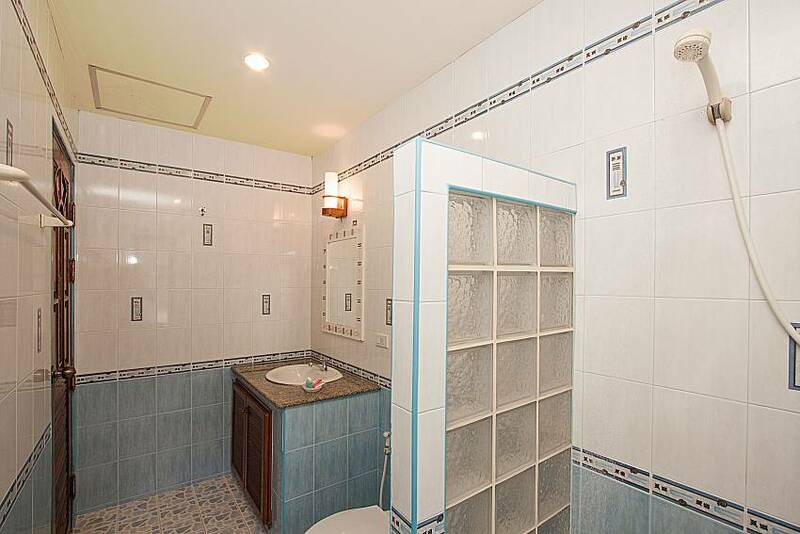 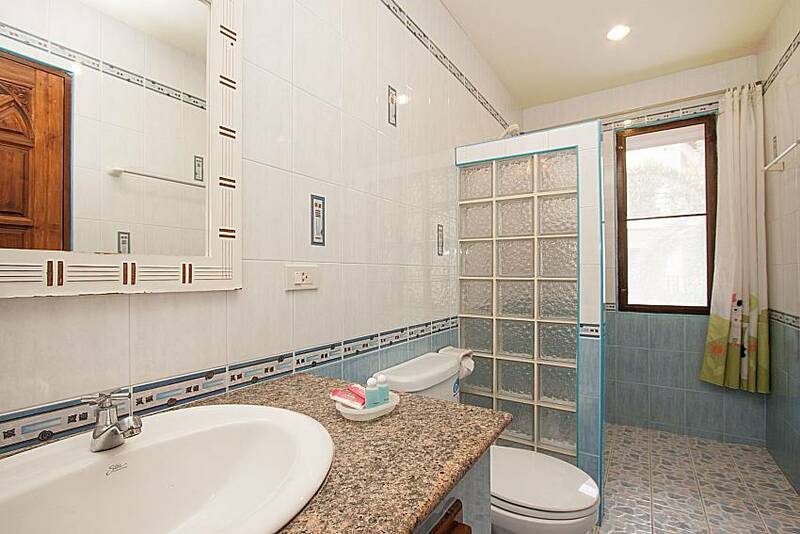 This floor see’s a spacious bathroom, tiled throughout with a sizable shower. 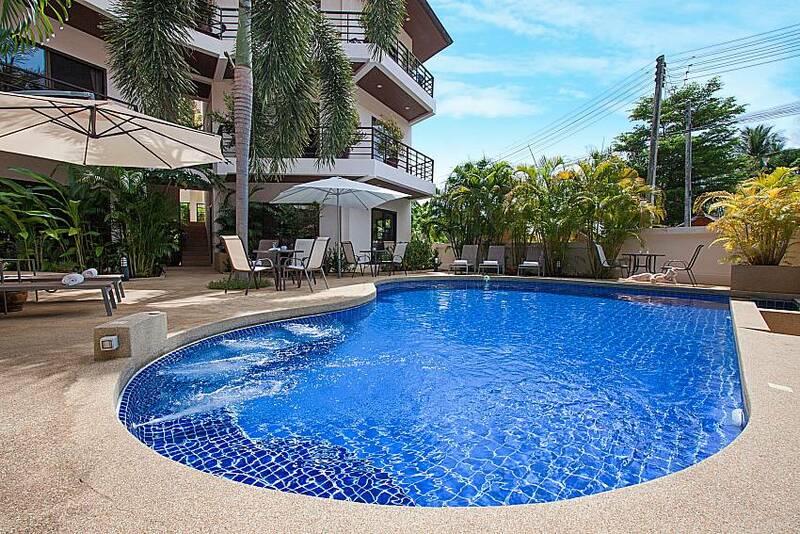 You will find the wonderful Chaweng Noi beach just 300 meters away from the Villa. 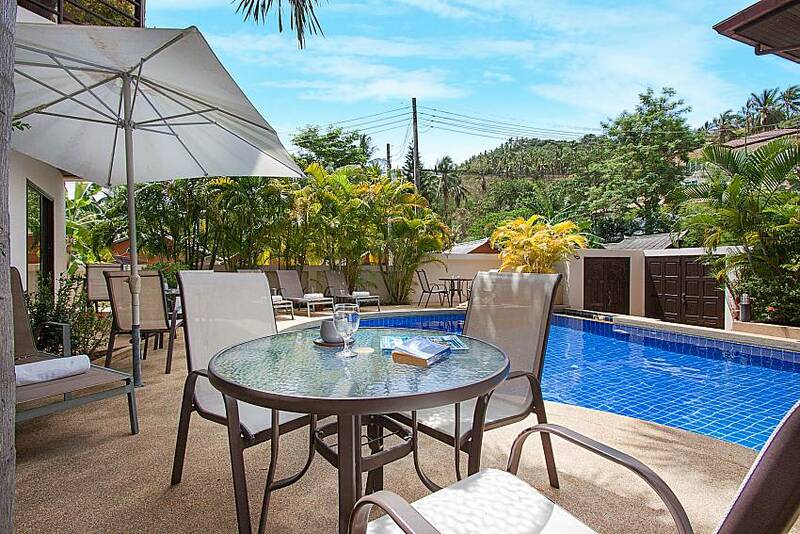 The beach is amongst those famous in Samui due to the powdery white sand. 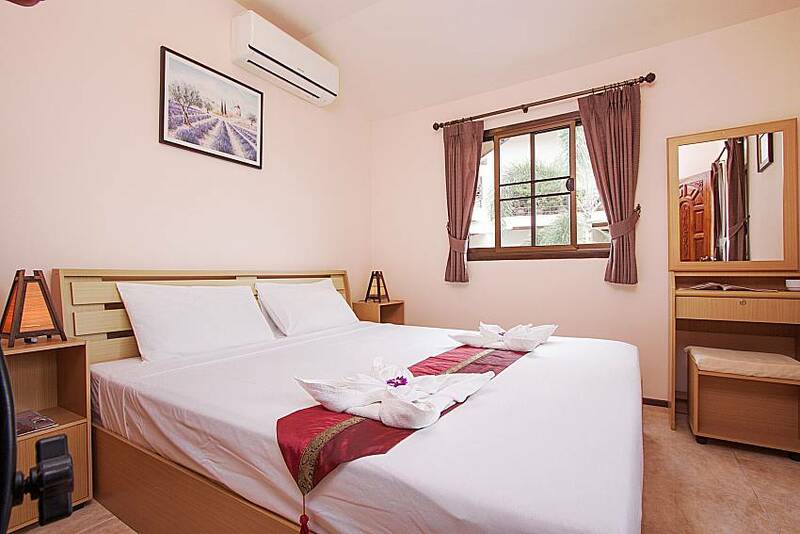 If you are looking for restaurants, shops or nightlife, you can find these just 10 minutes away in a taxi in Chaweng or Lamai with its colorful night market. 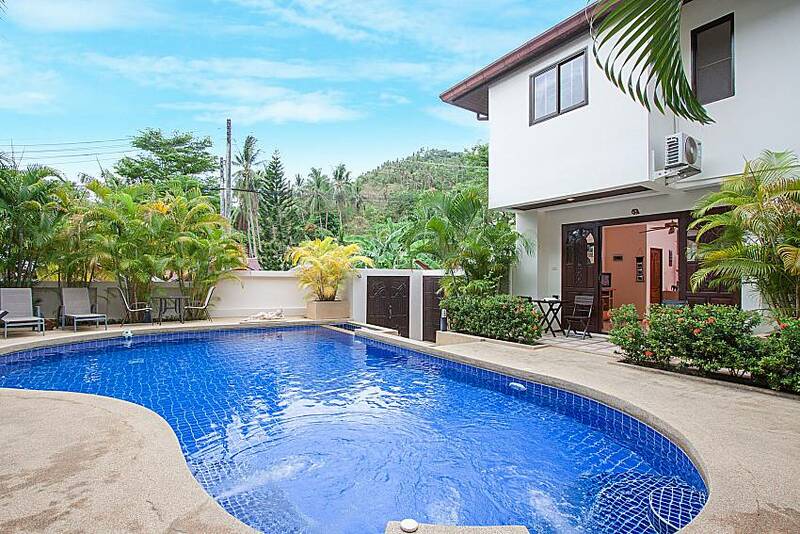 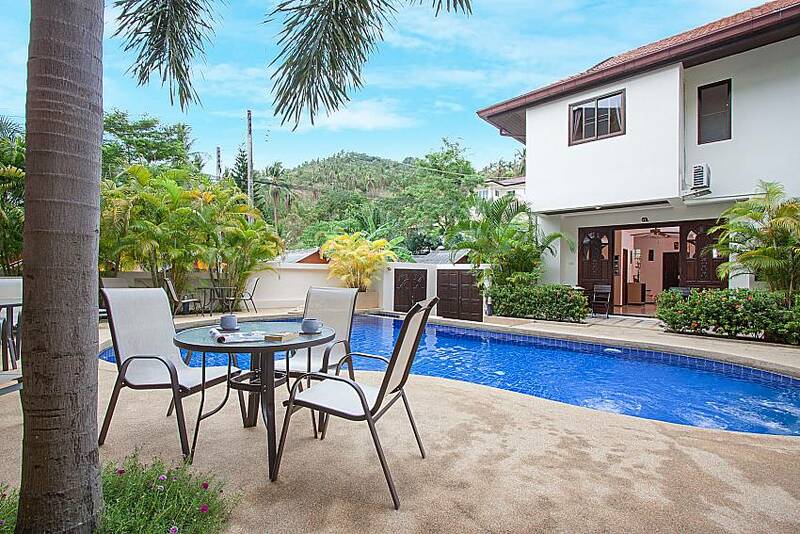 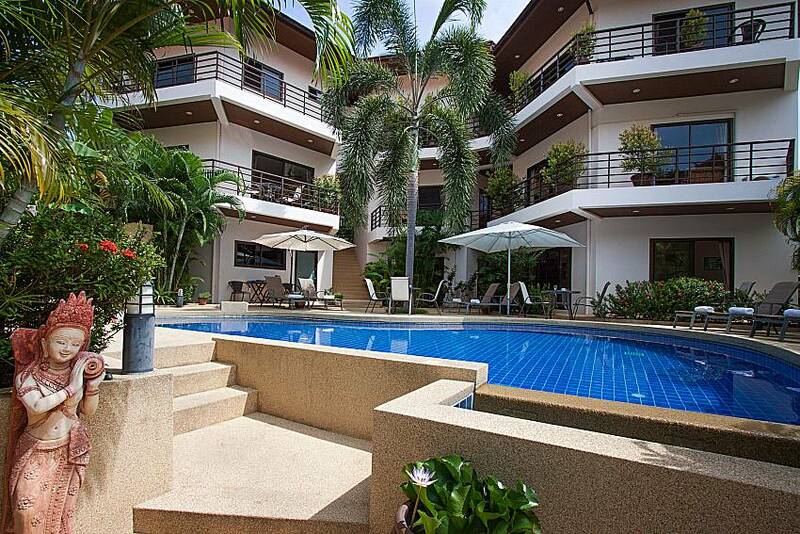 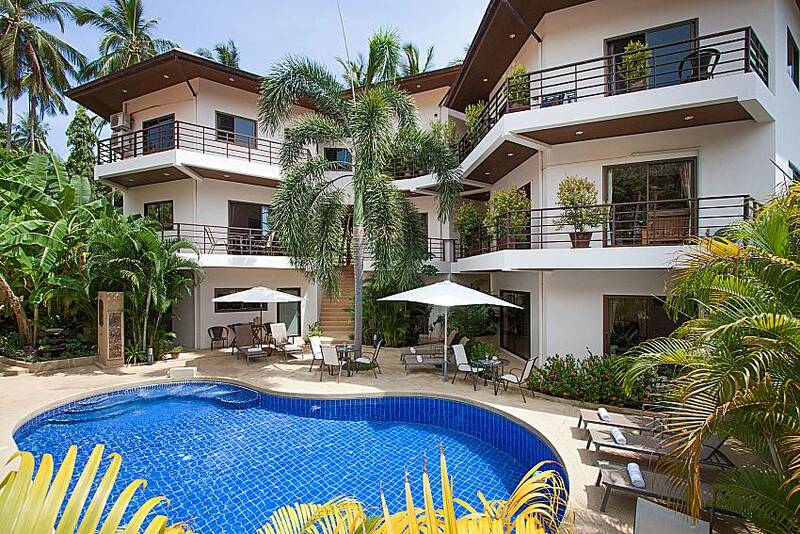 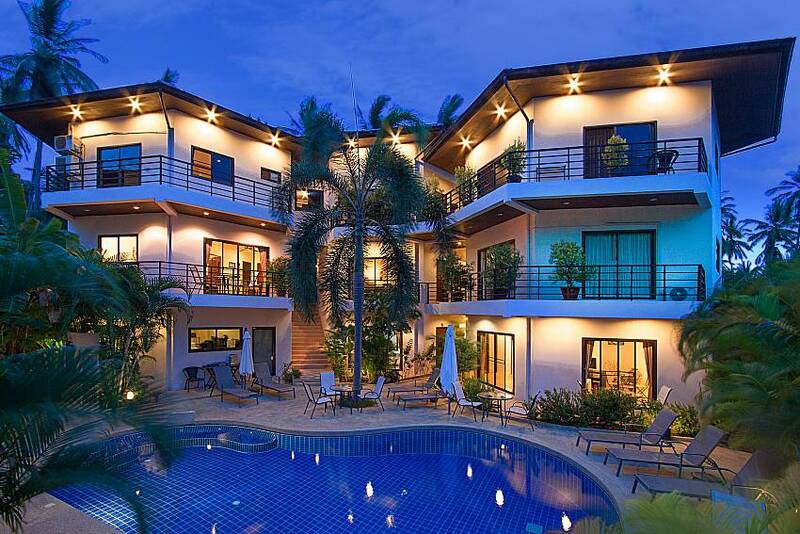 Click here to find all our dazzling Samui villa rentals.